Our FlashUV5 and FlashUV7 254nm Ultraviolet light is a convenient tool for anytime you need a portable, 254nm light source. They have both a side 254nm 4 Watt light and a front Krypton flashlight bulb. 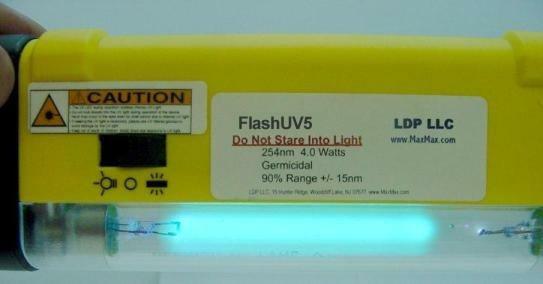 The FlashUV5 unfiltered light emits a 254nm light that includes visible light. The light has a light bluish glow. Typical uses are for germicidal disinfection, EPROM erasure, UV adhesive curing and laboratory experiments. The FlashUV7 filtered light emits a 254nm light and only a slight bit of visible light. Very little of the light emitted can be barely seen by the human eye. Most of the light emitted is below human perception. However, like the FlashUV5, the FlashUV7 does emit light that is dangerous to all living things. Typical uses are for shortwave fluorescent work, forensic work and laboratory experiments. The FlashUV7 is a good companion product for our shortwave inks and powders. The 254nm Ultraviolet Lights are also called Germicidal lights because the UVC light emitted will kill bacteria, mold and fungus spores, germs, micro-organisms and airborne bacteria. Germicidal lights are used in hospitals, poultry brooder rooms, incubators and hatcheries, bakeries, bottling factories, breweries, dairies, pharmaceutical companies and for water sterilization. UV light and Anthrax: UV light will kill Anthrax spores. However, Anthrax is more resistant than some other bacteria to UV light. The Center for Disease Control (CDC) has not published any standards for the length of time and intensity of 254nm light to kill Anthrax. Please read the page on Technical Details to learn more. 254nm light is harmful to all living organisms. Special measures must therefore be taken to afford protection against direct radiation.